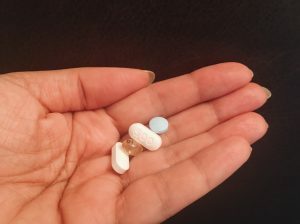 The average elderly patient takes over five different medicines, and 55 percent of U.S. adults are prescribed more than one pharmaceutical drug. However, only 50% of prescriptions are taken correctly. The importance of medication compliance, or taking your medications as directed, can’t be overemphasized. However, we know managing prescriptions has its challenges. Since the majority of our patients now own a smartphone, we see technology as a tool that can improve medication adherence. Android and iPhone apps, computers and other devices make medication management easier by letting you set intake and refill reminders, track multiple prescriptions, and provide convenient ways to connect with healthcare providers. Here are a few of our favorite iPhone and Android apps that make medication compliance a little easier. ​With five million users, Medisafe is one of the most popular medication apps available. It’s a high-rated virtual pillbox that allows you to set timed reminders around individual prescriptions, refills, and more. Once you’ve added your medications to the app, you can read or watch videos that provide detailed and accurate information for every prescription you take. It also lets you designate someone you trust to aid you through the process. Parents can use Medisafe to manage multiple household prescriptions, doctors can use it to follow progress, or a caretaker can be notified if you forget to take a drug. Medisafe is free on Google Play and the iOS App Store. Are you seeking something simpler? Round Health makes managing medications easy by providing an attractive and straightforward interface. You can program individual or multiple prescriptions, choose your dose from a tailored list, or enter custom dosages. Once you’ve added your prescriptions to the app, you can set timed reminders when each drug needs to be taken, the correct dosage, and refill notifications that go straight to your device. The app also offers a historical overview covering when you’ve taken your medicines as well. Round Health is available for free at the iOS App Store. The WebMD app is a one-stop shop for basic health information. The app provides medication instructions, dosing info, planners, and more via push notifications. Learn more about your prescriptions through their robust internal search engine. Using it will help you understand and track symptoms, give you in-depth drug information, and provide resources on how to track down doctors and pharmacies in your area. WebMD’s medication reminders are effortless and effective, and make medication management simple. WebMD’s app is free across all mobile devices. PillDrill is one of the more high-tech options you can turn to for medication reminders. It’s based around an electronic tracking device called the Hub that announces when you need to take your prescriptions. It also lets you scan your prescription packaging, teaches you how to take them correctly, and records your mood to track your well-being. The PillDrill app is more supplemental, letting you set your dosing schedule and record what you take when you’re away from home. Additionally, it allows you to share medication information with caregivers and physicians. The whole system is $279 and works on iOS and Android devices. MyMeds helps you stay healthy by sending you daily medication and refill reminders across multiple notifications through email, text messages, or in the app on your phone. It’s a secure app with an intuitive interface that allows you to quickly add new and existing prescriptions with ease. Once you’ve added your personalized medication list to MyMeds, the app provides best practices, where to find the best medication prices in your area, and information about side effects. You can also invite your physician or a loved one to assist with your medication management through the app’s “circle of care” feature. MyMeds free on Google Play and iOS App Store. With how busy our lives can be, we need all of the help we can get to make prescriptions easier. Smartphone apps like these allow you to set various reminders throughout the day, track when you’ve taken a drug, and lets you connect with your physician or a loved one to make medication management easier. For more in-depth questions about your prescriptions or medication compliance, reach out to Northwest Primary Care pharmacy.